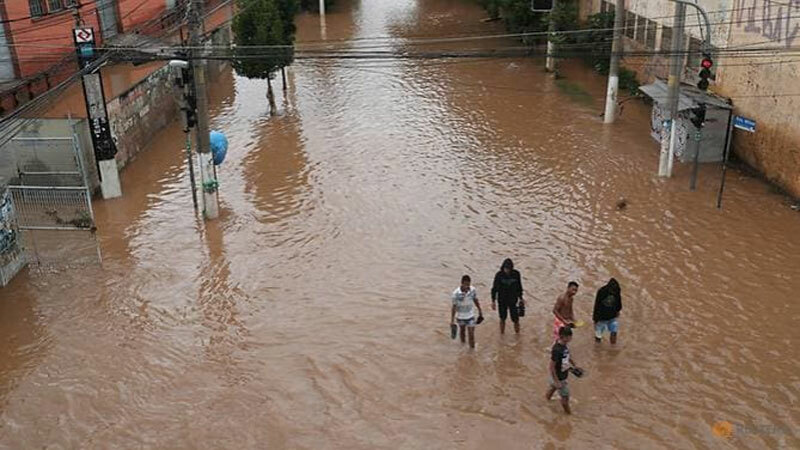 Floods caused by torrential rain in and around Brazil's financial hub Sao Paulo killed 12 people and hurt six others overnight, firefighters said yesterday. In the town of Riberao Pires on the periphery of the country's most populated city, four members of one family died and another two were injured when a house collapsed around midnight. Another landslide killed one person in Embu das Artes, while three neighbors drowned in Sao Caetano do Sul, one in Sao Paulo, two in nearby Santo Andre and one more in the industrial city of Sao Bernardo do Campo, authorities said as they provided an updated toll. Firefighters had to rescue several people stranded by the water and mud in Sao Paulo, Brazil's biggest city and financial capital, with more than 20 million people. The late summer rains submerged several neighborhoods and blocked major arteries into the sprawling metropolis, cutting train and bus services in some areas. There were also mudslides in parts of the city, with more heavy rain forecast for later Monday. Governor Joao Doria asked residents to stay in their homes as much as possible.